Back in March of this year, the so-called ‘civilized world’ witnessed a man cannibalize another man on the freeway. The man who was eating was a black man, who they say was high on drugs as he committed the atrocious act upon the other man. His act may have been physically influenced by high doses of narcotics, yet what pushed him to desire human flesh? What led him to de-evolve back further into his beast nature? And most importantly, why do people still think that the warning of God’s Word that we are at war with Higher Spirits are just some tall tale? Many of us who have witnessed God’s Word manifest know that the Enemy has a great plan for the undoing of the whole world. Each tragedy like this one is another move towards the destruction of man, and what’s really scary about this is that we are helping it along! Our disbelief in God and our distorted thinking that the Devil doesn’t exist as well allows us to be pawns in our own downfall because since we don’t believe that there IS a war, then we don’t seek ways to counteract the Enemy’s assault. Our lack of a mass relationship with God causes a great and detrimental weakness in our spiritual armor that we all possess, yet refuse to acknowledge. our desire to be controller’s of our own fate and destiny is what contributes to the demise of man morally, spiritually and physically. Our arrogance of superiority through science and innovation gives the Enemy all that it needs to completely disrupt the very fiber of our being, thus creating a certainty of annihilation of what is deemed, ‘mankind‘. We as a people believe in nothing but what consistently fools our senses and better judgment. This is a great weakness that man has developed ever since the beginning. Since the essence of God is beyond the basic senses and understanding of man, man begins to convince itself that the possibility of a “all mighty deity” is impossible to fathom because of the illusion of free will and the influence of the Enemy in our lives. We confuse God with ourselves and the limited emotional states that we enter into each day. We see the devil as some sort of action figure that exists in movies and folklore. Yet, the existence of both has proven true each day. BluNoteTM focuses on how the artist presents him or herself within the music and ministry of the music. Many artists are compelled to place themselves at the forefront of the music project, whether it be Hip-Hop, R&B, Country, Jazz, Blues, etc… While this method is acceptable within most of the genres, Gospel and Christian based genres are supposed to be unique and separate from this practice seeing that the actual song and/or message is not directly focused on the artist and who the artist happens to be. The problem comes when the Gospel/Christian/Spiritual artist becomes the center focus of the music produced. When the people come to see the artist, not to hear the message, per se, there becomes a sense of confusion. The BluNote concept sees to remedy this by emphasizing the spiritual message within the music while the artist sinks into the background. This assists in the listeners focus on what is being said and who is TRULY saying it, not the one being used to relay the message to them. What is the Divine IPO? 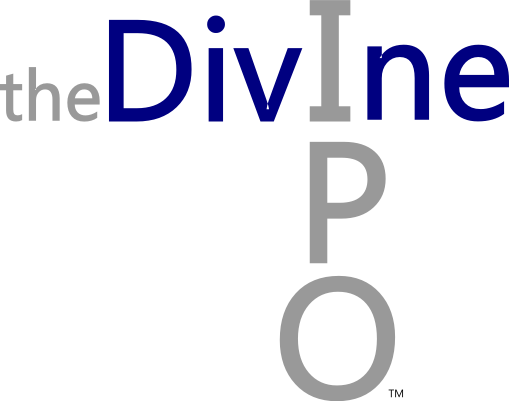 The DivineIPO means to achieve insight positively and to have obeisance to God by establishing a continuous connection to Spirit, through Christ and His teachings.